With today's communications industry experiencing major changes on an almost daily basis, media managers must have a clear understanding of the different delivery platforms, as well as a grasp of critical management, planning, and economic factors in order to stay current and move their organizations forward. Telecommunications Management helps current and future media professionals understand the relationship and convergence patterns between the broadcast, cable television, telephony, and Internet communication industries. Author Richard A. Gershon examines telecommunications industry structures and the management practices and business strategies affecting the delivery of information and entertainment services to consumers. He brings in specialists to present the finer points of management and planning responsibilities. Case studies from the International Radio and Television Society (IRTS) competition supplement the main text and offer an invaluable perspective on management issues. Developed for students in telecommunications management, electronic media management, and telecommunication economics, this volume also serves as a practical reference for the professional manager. Contents: Preface. Part I: The Telecommunications Industry Structure. Telecommunications Economics I: Principles of Market Structure, Conduct, Pricing, and Growth. Broadcast Management. Cable Television Management. Telecommunications Economics II: Principles of Public Utilities, Common Carrier Services, and Information Carriage. Telephone Management. J.M. Kayany, The Internet. Transnational Media and Telecommunications. Part II: Management and Planning Strategies. 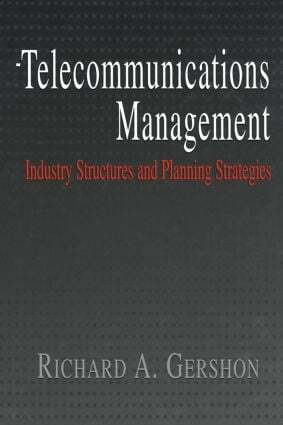 Telecommunications Management. R. Rightmire, Telecommunications and Leadership. R. Rizutto, M. Wirth, Telecommunications and Financial Management. S.M Chan-Olmsted, R.A. Gershon, Telecommunications Marketing. Telecommunications and Strategic Planning. Appendix: The IRTS Case Study Series. Richard A. Gershon (Ph.D., Ohio University) is Professor of Telecommunications in the School of Communication at Western Michigan University. Dr. Gershon is co-founder of the Telecommunications Management program at the university, where he teaches courses in telecommunications management, law and policy and communication technology. He is the author of Telecommunications Management: Industry Structures and Planning Strategies (2001) and The Transnational Media Corporation: Global Messages and Free Market Competition, winner of the 1998 book of the year by the U.S. National Cable Television Museum. Dr. Gershon has twice been selected for teaching honors, including the Steven H. Coltrin Professor of the Year Award (2000) by the International Radio & Television Society (IRTS) and the Barry Sherman Award for Teaching Excellence (2001) by the Management and Economics division of the Association for Education in Journalism and Mass Communication (AEJMC).